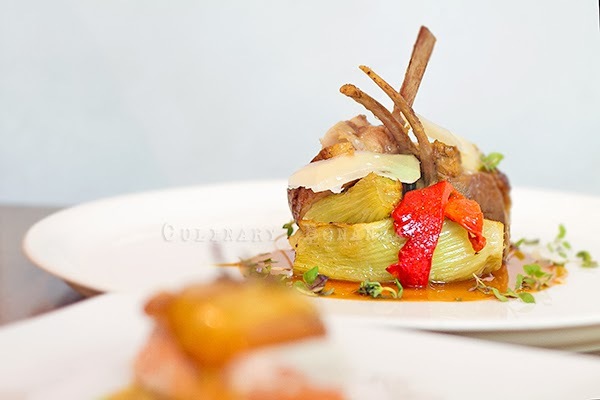 Any chefs would acknowledge the crucial role that their suppliers have in shaping their culinary creations. 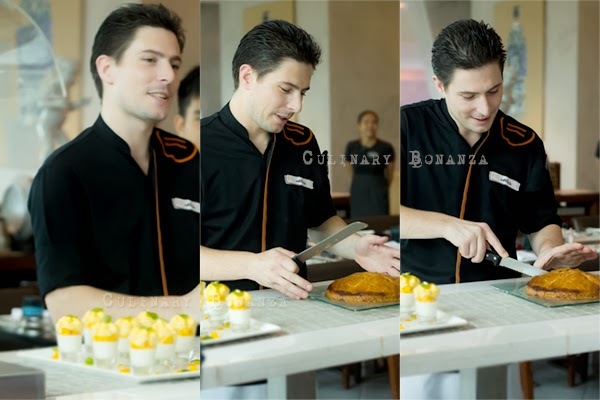 A statement that is perfectly illustrated when Chef de Cuisine Eric Baudru of Pullman Jakarta Central Park recently came up with a new range of Italian menu creations which prominently feature the fresh buffalo cheeses he acquired from the supplier, ItalEat Milano. When I met them a few weeks ago, the ItalEat Milano team of father and gorgeous daughter, animatedly explained, with a lot patience and passion about their unique fresh buffalo cheese products as well as other premium cheese and truffle products such as truffle salt for cooking to ready-to-use truffle sauces. Alessandra, the daughter, told us about how buffalo cheese is superior to the normal cheeses made from cow milk. In terms of the nutrition, mozzarella di bufala contains more protein, calcium and lower in cholesterol. There are less water buffaloes reared than are cows, so that makes buffalo mozzarella even more precious. To make things even more complicated, only buffalo mozzarellas produced in the Campania region of Italy can bear the "Mozzarella di Bufala Campana" trademark, a highly regarded trademark that guarantees the authenticity and quality of the buffalo mozzarella. Antipasto Freddo Burrata Bufala Di Campania - appetizer made with Heirloom tomatoes, fresh buffalo burrata, basil spherification and pickled radish, all of which sit prettily on a bed of reduced balsamic. 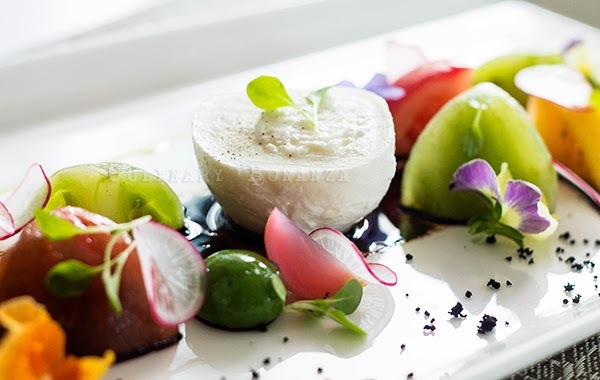 The pretty dish is a lovely treat to the eyes, but who can resist the lump of burrata in the center? The delicate taste of buffalo mozzarella makes it imperative for the other ingredients to be more subtle, which is what the heirloom tomato does perfectly here. Recommended for sharing as the serving is quite big. FYI, Burrata (means "buttered" in Italian) is fresh Italian cheese made from mozzarella and cream, the outer 'shell' is solid mozzarella while the insides, as Alessandra describes it, "buttery" rich from the soft and creamy texture of the combined mozzarella and cream. Antipasto Caldo Mozzarella Affumicata - appetizer made with salmon, served with root salsifi and topped with smoked scamorza or smoked mozzarella. This appetizer is divine, my favourite among the dishes we tried. 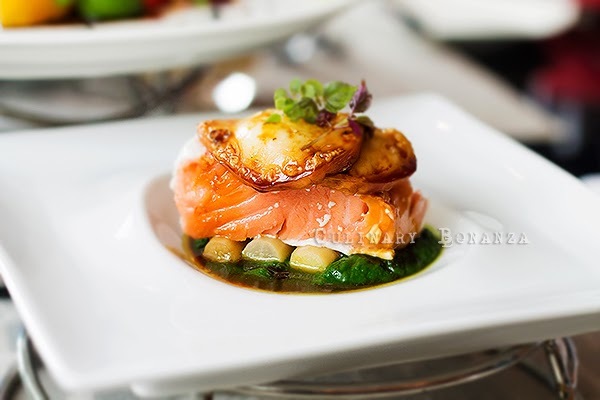 The salmon is very tender, it is cooked but still retains the raw texture and does not have the odour I expect from cooked salmon. In layman term: half-cooked. The smoked scamorza is garnished with sweet soya sauce, which is unusual for Italian dish, but I find it combines well with the smokey savoury scamorza. Best consumed immediately while still warm, as the scamorza would be quite chewy at room temperature. 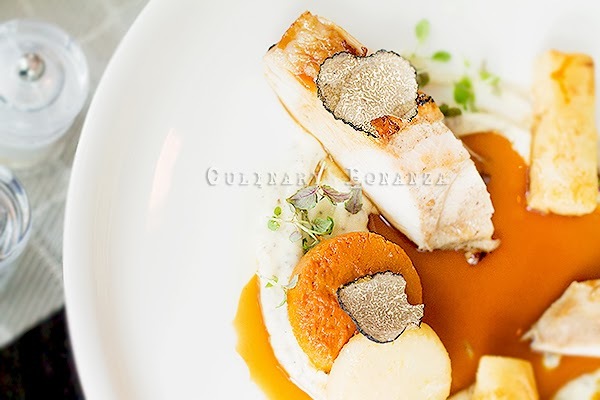 Tartufo Nero - main course, low temperature cooked turkey breast slices served with black truffle, scented winter vegetables puree and roasted turkey bone jus. Unfortunately, both main courses feature meats that are not on top of my favourite list, as I prefer meats with more neutral and subtle scents. If I have to choose, I would prefer the turkey over the lamb, simply because the turkey dish has got (black) truffle in it. 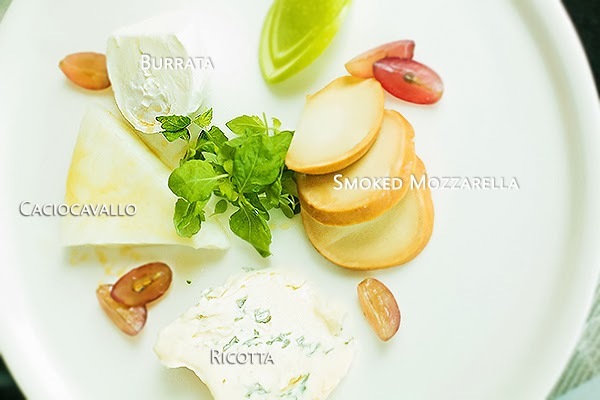 Selezione Di Formaggio - a platter of assorted cheeses: caciocavallo, burrata, smoked mozzarella and ricotta. 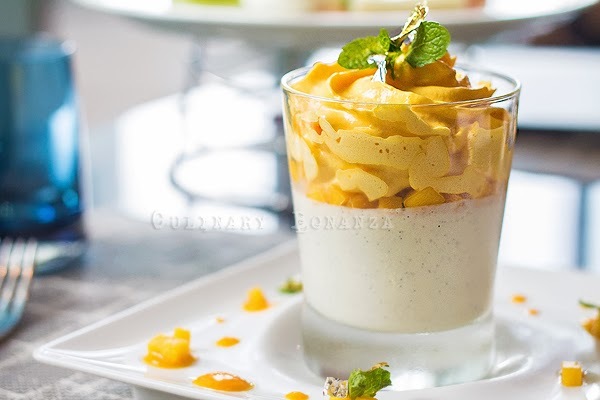 Panna Cotta - a divine dessert of Vanilla Mango flavoured Ricotta Panna Cotta. By the way, ricotta means "recooked", a name derived from the method of processing the cheese to produce it and ricotta is safe to be consumed by those who have protein intolerance. 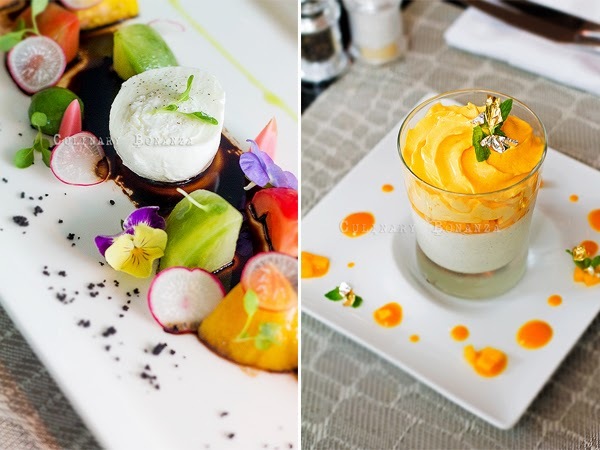 The mango cream is as light as cotton, and the vanilla panna cotta made with ricotta cheese taste unlike the standard gelatin-based panna cotta. You've got to try to taste the difference. You'll be shocked by the price, but when you see the serving size, you will understand why. 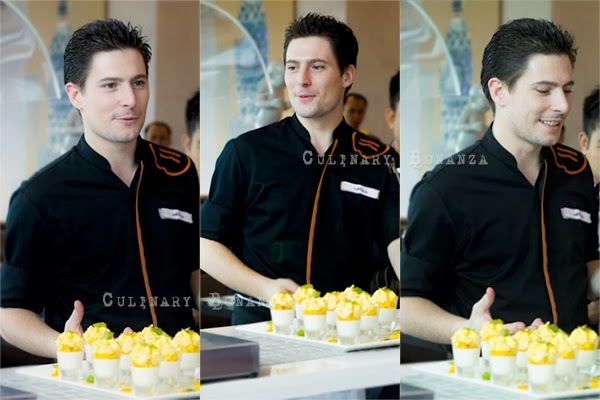 I met several fresh faces at Pullman Jakarta Central Park, there's the new Pastry Chef and the EAM of Food & Beverage. Welcome to Jakarta! 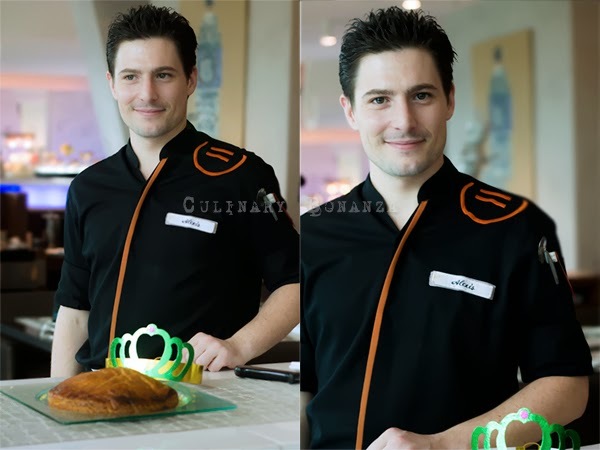 Pastry Chef Alexis's shared his Galettes des Rois - The French King Cake. The dessert is not just any ordinary sweet tooth's treat, as it is steeped in history and culture. Historically, it is the way the French celebrate The Epiphany (6th January), a moment in the Biblical timeline when Three Wise Men from the East came to worship Baby Jesus. Culturally, Galettes des Rois is enjoyed with the family, cut into the exact number of people present and whoever gets the slice with the lucky charm in it, gets to be the 'king' for the day - hence the name 'French King Cake'. 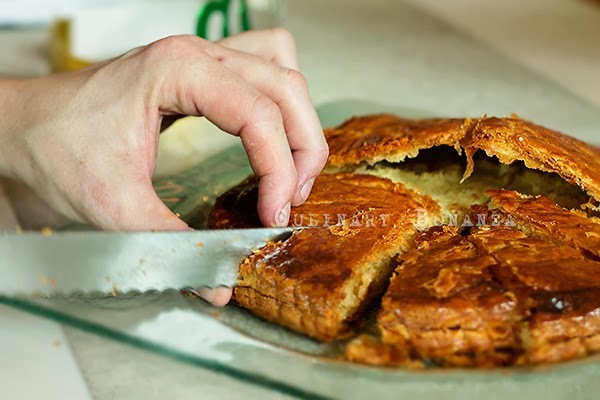 The Galette is actually a type of flaky puff pastry with frangipane (sweet, almond-based / flavoured) filling. This one tastes amazing, smells very buttery rich, light and crisp, with just the right amount of filling. Absolutely delish! Now, the most Exciting part of this post. I am going to unashamedly gush about my crush for Pastry Chef Alexis. I think he's Italian, I was so fixated to take these pictures, I didn't remember or accumulate enough courage to talk to him. LOL. I'm melting and hyperventilating!!!! *gasp! gasp! * Can someone call the medics please? Haha, alright, those few photos above are just a small treat for you for reading this far. 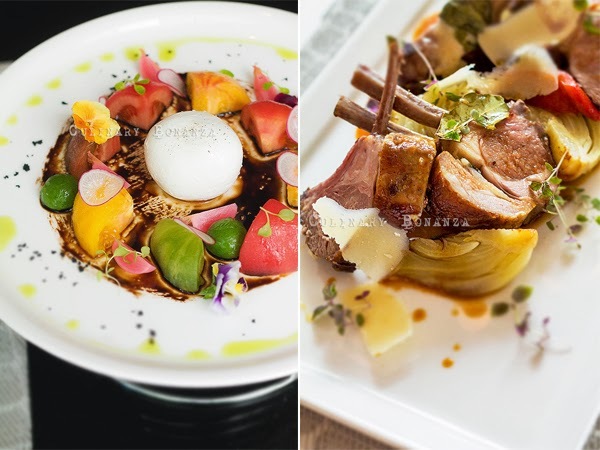 Basically, Collage is not just an average all day dining restaurant in a five star hotel. Don't just come here for the buffet, but what I'm saying is that the a la carte menu, especially the new Italian menu is definitely worth to try. 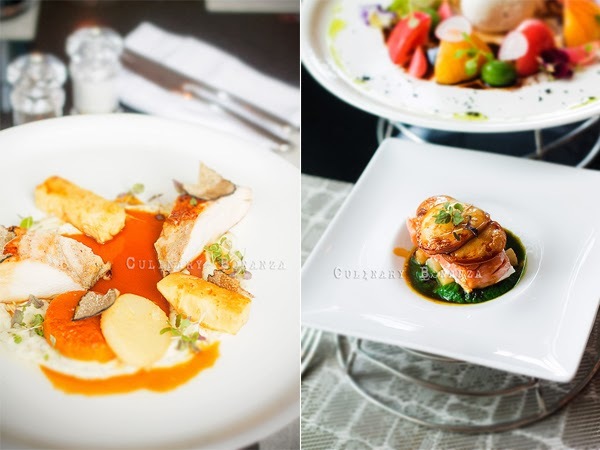 Fine Dining dishes in West Jakarta? You know where to go find them now.